Thing 1: Never owned my own cell phone and perhaps never will. Thing 2: Took up distance running early last year to be able to hunt like those master hunter-gatherers, The Kalahari !Kung, if and when the need arises. Thing 3: Will most assuredly expire if I don't have a cucumber slice with a sprinkle of pepper on my cracker with cheese. Thing 4: Whilst brushing my teeth every night before bed, simultaneously do frantic leg raises. Thing 5: Just completed The Boy's scrappy crochet blanket started during the Christmas holidays. See photos. Okay, cough it up. What is one thing I should - but probably don't - know about YOU? I admire you for not having a cellphone! I withstood it until 2006! :) Seriously a liberating thing. Cheers! No cellphone, wow, you are even more liberated than me. I have a very old one, no smart phone. I only use it to be called by Mr DC when he’s travelling abroad and to send text messages. Only a few family members and friends have my number. And my eyes are green! Beautiful green eyes (like my middle daughter). Mine are boring brown. That blanket is gorgeous! As are you. So fun to learn these deep dark secrets! The blanket looks cosier than anything - brrr, you are all snow up there. One thing you do not know about me...I know how to make stained glass windows. Okay! 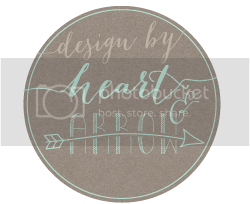 You really must share some stained-glass projects on your blog one day. I'd LOVE to see!!! Your finished crochet blanket looks wonderful!! Wow, distance running...eh!! Impressive. My hubby keeps trying to get me cell phones, used ones....but I never use them, so he sells them. Ha!! I guess I'm not up with the times...lol..as Brad would say!! I love The Boy's scrappy blanket! Looks like it will get a lot of immediate use with all that snow! One thing you don't know about me...I make my own toothpaste, deodorant, lip balm, shampoo (I'm actually 'no poo'), lotion, laundry detergent, toilet bowl cleaner, glass cleaner, and bread. Just to name a few - ha! Holy mackerel Karen, that's amazing! I'd love to learn how to make all that stuff. We'll have to talk sometime! Karen, my brother just said something silly the other day --"shampoo for my real friends, and real poo for my sham friends". Don't know where he came up with that. It looks very, very cozy - nice colors too. I am learning how to knit!! Knitting is a beautiful craft Melissa. I wish I was better at it! 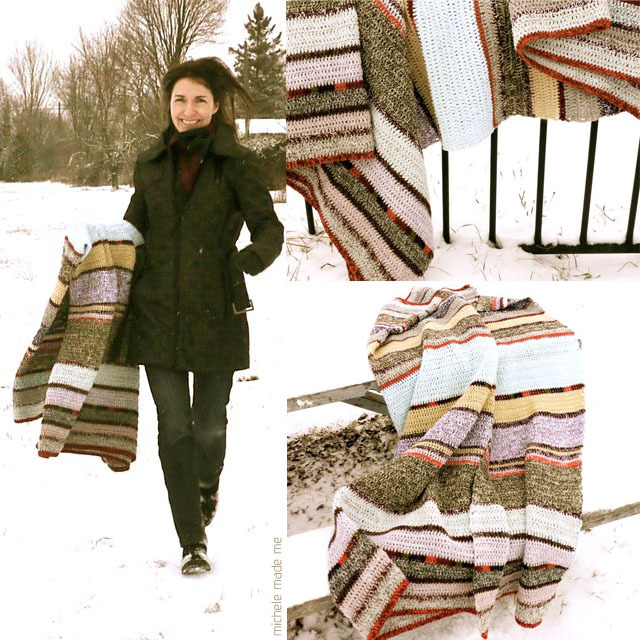 That snowy background is perfect for showing off your crochet blanket! It turned out lovely. yes you continue to amaze me with your human versatility :) The blanket you made is completely gorgeous! What a lovely blanket. Like many, wish I could feel it just once to match the texture's appearance to how it feels. 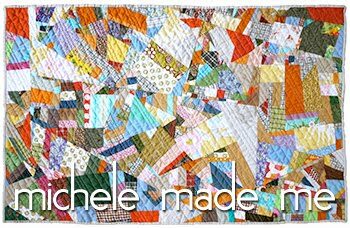 I've been returning to your origami sun blog a lot, and finally made one(yay), so I didn't realize that you blog regularly(duh). I think I would expire if I had to craft something with all new materials. I prepare a very yummy tiramisu'!! Do you want the recipe??? 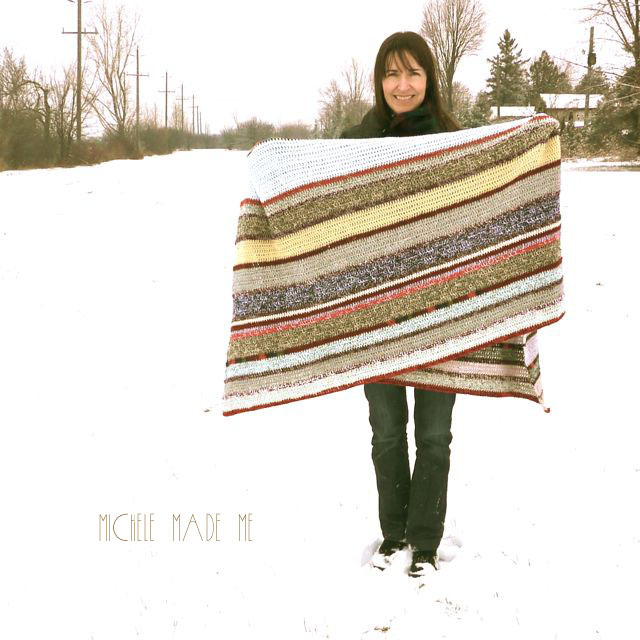 Ah Michele - what a gorgeous blanket - and great snowy photos! I can't believe you still don't have a cell phone! I've only just upgraded to a new 'smart phone' and all my friends thought I was behind the times! and what should you know about me? mmmmm.......I don't like coffee - but I do like coffee cake and coffee chocolates! That made me giggle. Fantastic! I love the blanket too. The colors are perfect together. Oh my goodness! I love this post. The blanket turned out so well. 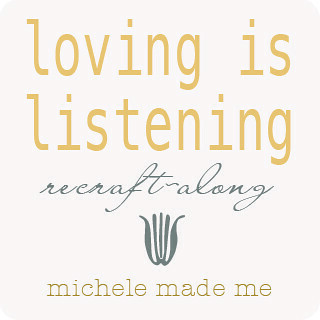 And it's fun to learn these things about you, Michele and your blog readers! As for me? I really love variety and can't stick to one thing for too long, but when I stick to it I do it obsessively. I'll let it go and then pick it up years later. An example is watercoloring. I haven't done it in years, but when I did it, I did it every day for several years. Then, I moved on, let it go. Now, within the past couple of weeks, I've picked it up again after not doing it for 10 years or so. Oh dear..its always so sweet to know about you! Thanks for sharing. Love this post and love that blanket. I took belly dancing classes way back when I thought I had a tummy but didn't! Love your blog. loved this post - the blanket is beautiful! don't get me wrong, i WEAR it, i just HATE it. LOLOL I adore your sense of humour and the blanket colours are smashing together.........it looks really great. The pictures of you and your blanket turned out great! The snowy backdrop is like a real-life white poster board backdrop, only better! How interesting to not have a cell-phone. I moved into a house 5 years ago that has no phone jacks in the walls, so a landline is not an option for me. Here's something about me that should offset my silly joke to Karen above, and class me back up a notch--I am a classical pianist and am in possession of an antique sidewalk-thrifted upright grand that is more than a 100 years old. I was just asked to play for my best friend's wedding reception in June. Yay! Beautiful shots of you! And the blanket. I love this post!!! Oh, I just adore this blanket. The stripes are so lovely. I'll need to do something like this to help use up my growing yarn stash too. Did you plan the design out or just worked it up as you went along?